A couple of months ago, I received a very nice email from someone who had the Burma Superstar cookbook and was planning a trip to Myanmar. She wanted to know where to eat. I responded, saying I was on the road, but that I'd send her ideas when I was home. And then my inbox got a little out of control and I somehow lost the email thread. I never responded with a proper list, but it's been on my mind. Since that email, I've also received similar requests from others who are thinking of traveling to Myanmar. I figured I'd tackle the question on where to eat in Myanmar, with one big caveat: Myanmar is changing quickly, and it's been more than a year since my last visit. In other words, use this list as a starting point, a way to get acclimated. And if you meet some really amazing cooks, let me know! I'll add them to this list so I can visit them next time. Instead of starting with a list of places, I thought it might be more helpful to start with a list of dishes you should look for in Myanmar, especially because many are difficult to replicate back home. -Mohinga: a noodle soup with a rich broth made with catfish, this is the country's national dish and the most popular breakfast food we came across. It's also now eaten throughout the day. It's to Myanmar what pho is to Vietnam, even though it's rarely seen outside of the country. -Shan noodles: A lot of restaurants will have signs in English saying they serve Shan noodles, which can be wet or dry noodles. What separates them from other noodle dishes is they come from the Shan State, which borders China. The noodles often carry five spice seasonings and are accompanied by fermented mustard greens. -Mangos during mango season (in the spring), especially, according to my friend Sarah, Sein Ta Lone—diamond mangos. There's a saying in Myanmar that loosely translates to this: if it's leaf, it's tea, if it's meat, it's pork, and if it's fruit, it's mango. 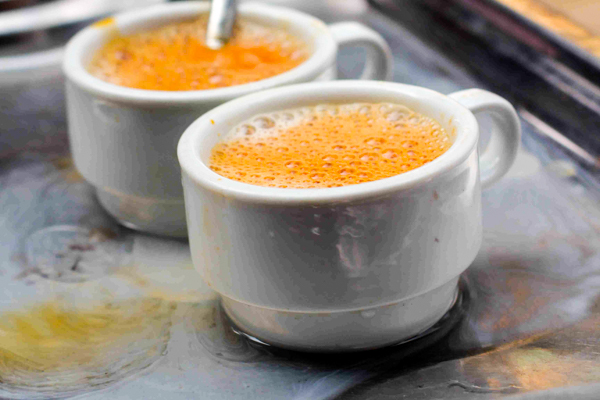 -Myanmar tea: Made with evaporated and condensed milk, this milky black tea (think a cross between chai and Hong Kong milk tea) keeps the country running. Find a busy tea house, like Shwe Pyi Moe Teahouse in Mandalay, and try it. If you like it very sweet, ask for more condensed milk. If you like it not sweet at all, ask to leave it out. But the first time, just try what they give you and see what you think. -Yogurt: I had a lot of delicious homemade yogurt on my travels in Myanmar and often piled a bowl filled with papaya and yogurt for breakfast. Yogurt may be one of the many contributions that India made to Burmese food culture. One of the best tea shops we visited was in a residential neighborhood of Yangon, and the only way I'd find it again is if I asked Nelson Rweel, who runs an English Language school nearby, to lead me there. For that reason, established restaurants (i.e., the one with Tripadvisor reviews) are easier to point people to. While some restaurants do this weird "continental cuisine" blend, with Thai noodles and roast beef on the menu, others are quite good. Some of the most interesting restaurants in this city serve regional foods that aren't common outside of Myanmar. The benefit of being in a big city is that you can sample them all in a couple of days. Min Lan Seafood Restaurant is named after the road (Min Lan) the first restaurant is located on – but locals call it "Rakhine Restaurant." We simply told the cab driver "Rakhine restaurant" and he knew we were going to Min Lan. It's best known for seafood--and heat levels: while much of what you eat in Myanmar is not nearly as spicy as what you may encounter in Thailand, this restaurant is the exception. Shan Yoe Yar specializes in food from the Shan state, going far beyond Shan noodles. The restaurant is in a teak mansion, which gives it an air of importance. Consequently, the owners were pretty cagey when we asked how to make certain dishes, but I would go back for the fried Shan tofu alone. Feel Myanmar Restaurant is a good first stop for a crash course in Burmese food. This restaurant group now runs countless locations of restaurants with various names, but I like the old one with outdoor seating. Kone Myint Thar is a recommendation from a contact who worked in Yangon for a few years. It's a spot for savory breakfasts and lunch. Pansuriya is another expat recommendation for salads and noodles – and, probably, noodle salads. House of Memories, although touristy, has good salads and gives you a peak into some of Myanmar's revolutionary past before the country was closed off by the military junta. Rangoon Tea House caters to expats who like to work on their laptops in a cool-looking space. And the building is beautiful. The food tends to be milder than elsewhere, but this might be because they do not use MSG. (Everyone else does.) My favorite part is their tea menu, which is presented as a primer on how to order Myanmar tea. Sharky's, which just had one restaurant a few years ago, now has outposts in Bagan and on the Ngapali Coast. It serves special-occasion western food (the place to go if you're craving pizza or gelato), but Sharky's also sells locally made foodstuffs. If you'd like Myanmar sea salt to take home as a souvenir, pop into the location off of Pansodan St.
MANDALAY: The tea houses in Mandalay are amazing, but I found the restaurants underwhelming on my first visit. But the next visit, we found MinGaLaBar Myanmar Restaurant, and we ended up having one of the best lunches in our entire trip. Go here for regional specialties from all over the country, many of which I never saw anywhere else. BAGAN: Since this spot is the most famous tourist spot in the country, the food here tends to cater to tourists (so you can find a lot of vegetarian places). The best way to eat here is to talk to your hotel or guest house about finding a home cook (not a hotel chef) to prepare local dishes. The most scenic place for a snack is on a sunset boat ride on thethe Ayeryarwady (Irrawaddy) River. (It's usually laphet served out of lacquerware and Myanmar beer). Beware the number of kids trying to sell you things at the dock, though—this is one of the only places in the country we encountered aggressive sales tactics tailored toward tourists. As far as eating Burmese food on the street, goes, it can be risky, and the risk isn't always worth it. This is especially the case in destinations such as Mt. Popa: even though it may look tempting, I wouldn't eat from anyone selling food on one of the 777 steps that lead up to this mountain temple (it's better to wait until you're done with the hike). If you are feeling daring, though, heed the advice of my friend Sarah: while living in Yangon, she stuck to neighborhood tea shops and roadside stalls that were always busy. -Bogyoke Aung San Market caters to foreigners looking for souvenirs, but in front of the market are women selling several kinds of South Asian sweets. -19th Street between Mahabandoola and Anawrahta roads is the main night market. You can sit wherever you'd like, order from different vendors, and somehow they find you. The best bets are the food grilled on skewers—fish, meat and offal, and vegetables are the most common. After we ate there one night, we bought a durian from a roadside stall and the vendor cut it up for us on the street, handing toothpicks to eat it out of the shell. It was like encountering a strong Southeast Asian version of a stinky cheese course to finish the meal. There are a few things about Myanmar that make it less of a place for drinking alcohol and more of a place for drinking tea. The country is deeply religious and conservative, for one, and people go to bed early. Plus, government cronies control the alcohol trade. All this is to say that despite a history that includes the Pegu Club, cocktail culture here seems to have died off with British Colonial rule. To be fair, it was the British who were drinking those cocktails, not anyone else. What you will find here is Myanmar beer, a light beer reminiscent of Singha. But you'll also find amazing nonalcoholic options, from fruit juices, coconut-and-tapioca "heart coolers," and all that Myanmar tea. And everywhere you eat, you'll encounter mild green tea, offered free at the table. This English language publication keeps up on Myanmar's arts and culture scene. Their food section is especially helpful. I also put together a run-down of what I like to eat in Myanmar here.